By 1980, the downtown mall was facing a crisis as more key stores were lured away from Loudoun Street for strip malls on the fringes of town. Downtown entertainment and cultural activities were few and far between. Serious, comprehensive revitalization plans and a vision for the mall’s future were necessary in order to prevent a complete catastrophe. (1) (2) PHW was prepared to help the budding downtown revitalization efforts. (3) One way to accomplish that in a way that meshed well with PHW’s mission was through revisiting the architectural walking tour. 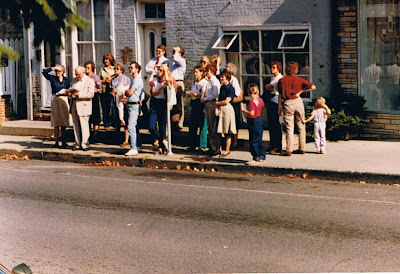 PHW had first made a foray into the world of self-guided architectural walking tours as a promotion of Winchester and its architecture in the 1970s, culminating in 1976 with a tour booklet written by Katie Rockwood and sponsored by several local banks. The tour itself had been praised highly by the National Trust for historic preservation in 1976 as being informative and easy to understand. The best part in the eyes of the National Trust consultant was the architectural style guide and glossary with its simple but informative illustrations and text. PHW updated the tour text, revised some photographs, reached out to more downtown businesses as sponsors, and reprinted the booklet in 1981. Although now out of print and the tour text and photos are once again out of date, the highly praised introductory text, architectural style guide, and glossary have been digitized and added to PHW’s growing digital library as a supplement to the more current walking tours. View the 1976 architectural walking tour introduction and glossary. In addition to the self-guided format of the booklet, PHW volunteers also led guided walking tours in the fall of 1984 and 1985 based on Katie Rockwood’s text. (4) Tours were also adapted for elementary age students and parents through Winchester Public Schools, reportedly drawing in 100 participants for one iteration. (5) PHW continues to stay involved with the walking tour scene, have helped produce the 250 Years of History and Architecture and Civil War self-guided and guided tours in the 1990s, and continues to host one-time tour events like the Italianate guided tour and the recent church tour. Just producing a walking tour by itself is no guarantee of getting more people to come downtown or boost tourism, but walking tours, particularly when combined with pithy historical facts, is one way to start generating “buzz” about buildings that might otherwise be overlooked. 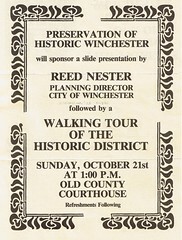 Have you been on a walking tour of Winchester lately? Check out the selection of guided and self-guided tours available at the Visitors Center. Is there a tour idea you’d like to see produced in the future? Let us know!